CHICAGO — Wearing white coats and stethoscopes, and carrying signs and banners, medical students rallied in support for universal health care here March 31. The students were joined by health care consumers and elected officials at the Health Care Justice Rally. Illinois First Lady Patricia Blagojevich, Rep. Jan Schakowsky (D-Ill.) and American Indian Health Service director Ken Scott were among the rally speakers. Illinois is on the brink of providing far-reaching health care reforms, according to the rally organizers. Signs that read “Everybody In, Nobody Out,” calling for the implementation of the state’s Health Care Justice Act, dotted the rally landscape. The Health Care Justice Act, signed into law by Gov. 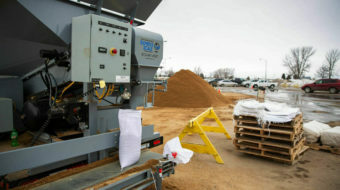 Rod Blagojevich in 2004, is to be implemented by 2007. The act would provide health care coverage for all the state’s residents — an unprecedented undertaking, according to health care policy experts. There are 1.8 million uninsured people in Illinois. A series of public meetings in each Illinois legislative district is taking place and a task force is set to present reform proposals to the Legislature, perhaps by August. The rally coincided with the American Medical Student Association’s 56th Annual Convention. The students were insightful, optimistic and enthusiastic towards providing health care for all people. Smriti Mohan, 25, a third-year medical student at St. Louis University, said health care access should not be based on employment. “Universal health care is a real possibility that can be implemented, it’s not as difficult as the government wants us to believe,” she said. Darla Severin, 28, who is a second year student at Arizona College of Osteopathic Medicine, emphasized that universal health care needs to include undocumented workers. Dock Winston, 28, is a national coordinator for AMSA’s Minority Affairs Committee and a third-year New Jersey Medical School student interested in urology and psychiatry. He said outreach to minority communities is critical. “A lot of minorities are not aware about the issues” regarding universal health care, he said. 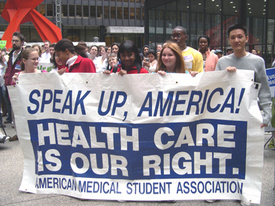 The Campaign for Better Health Care (CBHC), Illinois’ largest grassroots health care coalition, organized the rally with AMSA. Founded in 1989, the coalition is driven by the simple premise that health care is a right, not a privilege.